One of the great challenges to maintaining a regular blog is coming up with blog ideas. This is especially true for B2B and industrial company blogs, where there’s less breaking news and no constant stream of new products and customer reviews to talk about. Within B2B company blogging, many bloggers find that once they cover the basics of how the company works and toss in some employee bios, they’re pretty quickly running out of ideas on what to blog about. In fact, the most common reason that well-intentioned business blogs go MIA is the lack of inspiration. We’ve discussed sources of B2B blogging ideas once before, and this time we’re going to revisit the topic with our helpful friend, Google Alerts. Google Alerts is a way to have Google send you a notice anytime it finds a new page on the internet related to a search phrase of your choice. These alerts can be set to email to you or output to an RSS feed (which you can then put into iGoogle, should you choose) and if you go the email route you can choose how frequently it will send you the info. The information that comes from Google alerts is a fantastic source of inspiration for blogging. It will keep you up to date on not just the latest news in your industry (something you’re probably already familiar with) but also what people are talking about related to your business across the web — on forums, on blogs, on news sites, everywhere. It will provide you with an insight to interesting new ways people are using your niche’s products or services, concerns and questions of users in the industry, and of course let you know any time people are talking about your company as well. Any of these can be great fodder for a blog post: you can talk about a mention of your industry in mass media, you can answer questions that you see coming up or report on the latest news. Remember, even if it isn’t news to you, it may well still be news to your readers. First go to Google Alerts. Once there you can enter any search phrase and just use the drop-down boxes to select in what format and how often you want to get your news. In the Volume box the choice between Everything and Only the Best Results really comes down to how commonly people on the web are talking about your particular industry — and specifically your search phrases. If it’s a common topic you’ll want to use Only the Best Results to filter out the junk. But if it’s a relatively scarce and specific topic, you might prefer to select Everything even though you’ll get some unrelated junk in your alerts — but at least that way you know you’ll never miss out on something that is related, which can sometimes happen when you choose Only the Best Results. The idea here is to narrow the alerts down to things that are almost definitely going to be about your industry (and you’ll still be surprised how much unrelated junk gets in there) and then cover a wide swath of related topics. 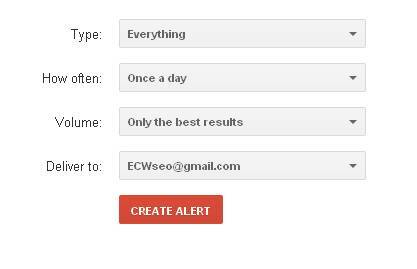 So check it out and create at least a half dozen to a dozen different alerts. Then monitor them for a couple weeks. I think you’ll find that you see at least one worthwhile blog idea every week from a healthy batch of well-chosen Google alerts. Not only that, but you’ll have a better understanding of what’s being said online about your industry and you’ll be communicating more meaningfully to your blog readers.